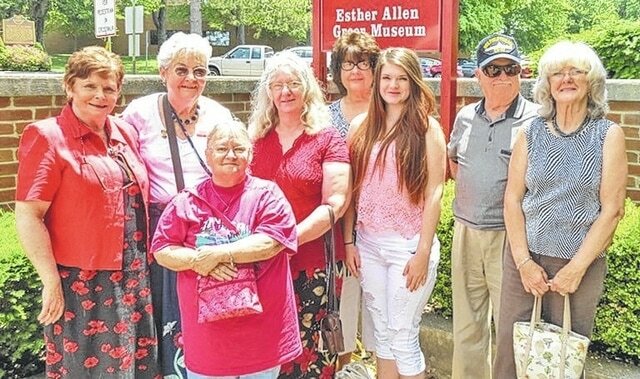 Attending the “Meet the Artists Tea” to conclude the Area Agency on Aging District 7’s 33rd Annual Art Show and Essay/Poetry Contest from Highland County were, left to right, Gretchen Huffman; Jeannette Knauff; Mary Bean; Mary Reed; Sandra Harvey; Rachel Fannin; Captain Irish, EE USN Retired; and Jo Ann Irish. The artwork of local seniors was recently showcased at the Area Agency on Aging District 7’s (AAA7) 33rd annual Senior Citizens Art Show and Essay/Poetry Contest that was held at the Esther Allen Greer Museum, located on the campus of the University of Rio Grande in Rio Grande. To learn more about next year’s Art Show, which is typically held in May/June of each year, please call 1-800-582-7277. Submitted by Jenni Dovyak-Lewis, director of community outreach, AAA7.